I am all over this!!!! The leveraging of the Artist subtype is something I had fervently hoped for. I can't wait. This is my most-anticipated box since Syndicate, can't wait to get my hands on it. I hope they will be able to have copies for sale at Gencon. Uh yeah, this made my day. 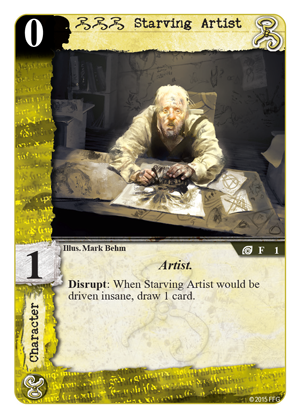 But yes, here's hoping for a few masks to go along with the Nyarlathotep avatars in the Shub expansion, two of my favorite parts from CCG-era Cthulhu. I can't imagine Fantasy Flight ending a product line so long as sales are good. Why would it? All they did is announce a new release. One would think that a lengthy LACK of new release announcements was more of a sign of doom than putting out more new stuff. No, they still have to do the Inner Order (Twilight 2nd box), pan-mythos, pan-human, and multiplayer boxes! At least! So excited for this box I love seeing big expensive ancient ones that may actually see play. 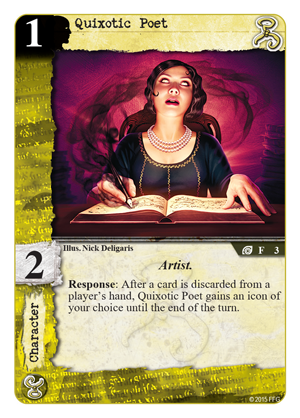 Also, really liking this subtype of effects that gain you success tokens when win terror. The box I've been waiting for since I started with the game two years ago, and the most desperately needed for a faction. 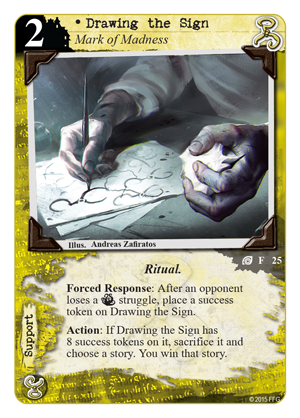 Along with the Tremé location announced for the Shub deluxe, we can hope for viable mono Hastur at last. 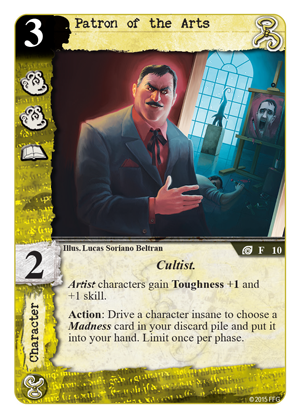 This version of Hastur is solid, I was hoping for targeted insanity capacity working even on terror/willpower chars, but winning stories quicker is something. Now let's hope for a few more truly good artists and lunatics - the couple of early-game chars showcased here are not spectacular. 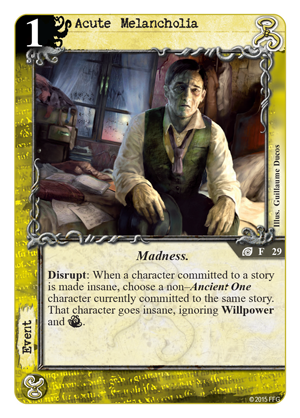 I'm glad they didn't give us another Hastur that had targeted insanity (ignoring terror/willpower) as that would feel redundant. 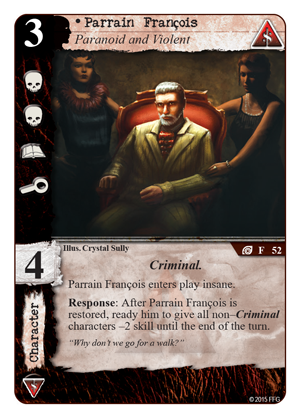 Plus it would've saddled a much-needed Hastur power on top of an expensive-to-play card. 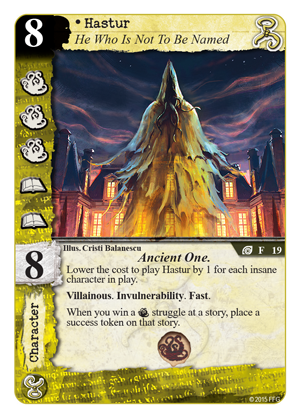 I'm much happier they made an event (Acute Melancholia) that gave us what we've all been wanting for Hastur. Could you use Patron of the Arts to drive insane a character you've committed to a story (say Starving Artist) to then play Acute Melancholia on another character? The difference is between "drive insane" and "made insane" but I think it works. 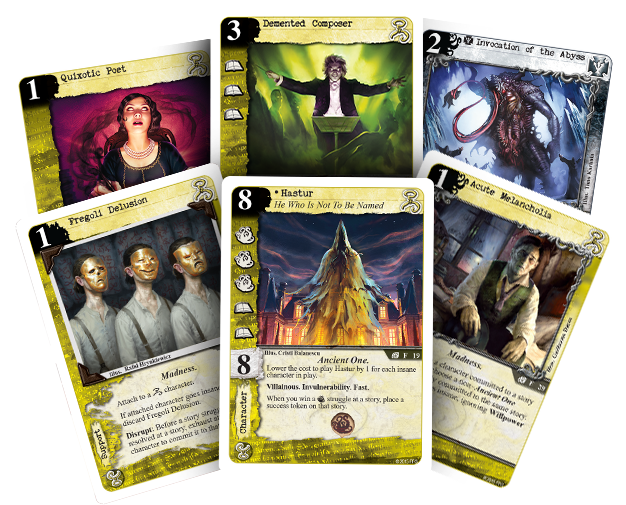 This opens up all kinds of fun possibilities with bonus card draw and The Greatest Fear. This is going to be a fun card. 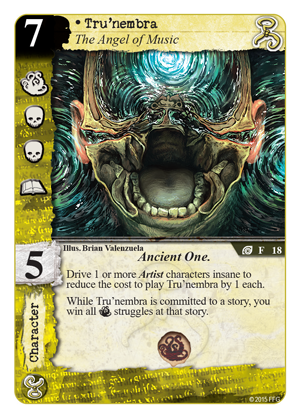 The new Hastur is everything I've been 'dreaming' of and the artwork of Tru'nembra is unparalleled!